The campgrounds feature a total of 125 campsites (including 26 pull-through sites). Thirty-five of the sites—the Class AAA sites—have 30 and 50 amp electrical, water, and sewer hookups. The 90 Class B sites offer 30 amp electrical and water hookups. All sites are reservable. Campsites are divided into four campground areas. Each includes a modern bathhouse with hot showers and flush toilets. Area "A" is near Lake Bailey and include sites along the lakeshore. 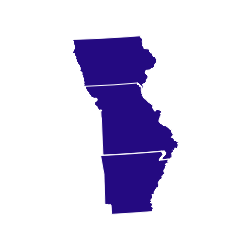 Areas "B," "C," and "D" are located on the south side of Ark. 154 in wooded settings. Other campsite choices in the main camping area include a 44-unit Rally-style Area with 20 amp electrical service available for camping clubs. A trailer dump station is centrally located near the Rally-style camping area. Petit Jean is Arkansas's only state park with its own airport. Our favorite Arkansas State Park - so much to do! This was our third time camping here. They have some of the best hiking trails in Arkansas as well as paved walking/bike trails, kayak/canoe rentals, overlooks, tennis courts, a pool, volleyball court, and much more. We lucked into a cancellation for one of the best RV sites in the park. It was super spacious, private, had a separate tent pad, and a view of the water and the wooded area. They had a guided night hike and other events during the weekend. There's a great ice cream and fudge shop 1/2 mile from the campsite. The bathroom facilities are nice and clean. We really enjoyed our stay here! 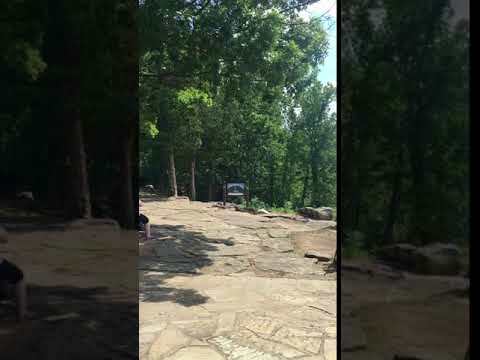 This was our first time at Petit Jean and definitely won’t be the last! My 1st suggestion: RESERVE EARLY to get a spot in Loop A or Loop B. We stayed in Loop C and I felt a little too secluded. The sites in C & D appeared to be a little smaller. I noticed several sites in B & C were uneven from roots pushing the asphalt up. Beware! Loop A is full hookup while B-D have electricity & water only. We stayed on Site 64 in a pop up style camper. It was fairly level and there were a couple good places for tents. Everyone around us was tent camping. My main complaint was the bathroom. The showers are not very private other than a nasty mildewed shower curtain, but there is no where to dry off or dress that is private. The showers were nasty on the weekend that we went, but it was also a revolving door of a massive group of 30+ tent campers that was using the showers. They were a lot cleaner on Sunday thankfully. The park itself is absolutely breathtaking! We went to the Cedar Falls Overlook, Palisades Overlook and Stout Point Overlook. We also made the hike down to Cedar Falls. It was absolutely incredible, but you should be somewhat in decent shape for this hike as it was not easy! We also hiked Bear Cave. It was nice with lots of exploring around the cave. We ate dinner at Mather Lodge one night. I had the Catfish Platter and it was excellent. I’m already ready to plan another trip here during the summer so we can utilize the boat house and a few other amenities that are closed during the off season. Well worth a fall visit though! This is a great campground back in the trees. It was raining and we didn't get that wet due to the tree coverage. The Cedar Falls hike is beautiful and a quick fun adventure. I recommend going to the Petit Jean Grave. The view is vast! Arkansas’ first and most popular state park. Lake with rental boats, trailer and tent site loops, lodge/hotel/cabins. Outstanding natural features, some of which are easily accessible. Very popular in the fall. Big waterfall with rugged trail to the bottom. Can’t see it all in a weekend! Two separate areas. one really wooded and the other open with a few trees. Services available and restrooms and showers available. Restuarant and cabins available. Car museum near. Hiking trails rated easy to difficult. Great overlooks.